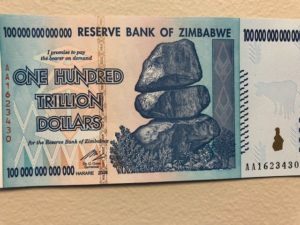 Think about it, a worthless 100 trillion-dollar bill. The Reserve Bank of Zimbabwe actually printed it. It is not a parody, it is not Monopoly money. It was worthless within days of being printed. Zimbabwe is the former Rhodesia, which, before socialist Robert Mugabe came to power in 1980, was called “The Jewel of Africa,” such was the prosperity there. Rhodesians fed themselves, exported food stuffs and was a popular tourist destination. But after Mugabe came to power, he moved the country toward socialism, with government interference in nearly every aspect of economic activity. From that point on, the country headed downhill and is now a basket case. The major blow to Zimbabwe’s economy was the redistribution of white-owned farms to blacks who had no knowledge of how the run them. Today, there is great euphoria in the United States, primarily because of the economy and a strong stock market. But the US is headed down the same road that Zimbabwe took despite all the regulations that the Trump administration cut. The government remains involved in all aspect of our lives, from healthcare to retirement. The heating-up trade war is an example of interference as it will increase costs of all imported goods. The exporters won’t be paying those tariffs, consumers will. 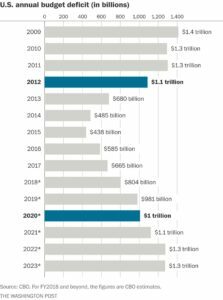 Although the Treasury isn’t yet printing $100 trillion-dollar bills, it will run a deficit this fiscal year (ending September 30) near $804 billion, and next year’s is projected to be just short of $1 trillion. By 2022, the Congressional Budget Office (CBO) sees a $1.3 trillion deficit – and that’s assuming no recession. By David Stockman’s worst estimates, the national debt will double over the next decade. The biggest drains on the Treasury are Medicare, Medicaid and Social Security as 10,000 Baby Boomers daily turn age 65. Congress hasn’t even talked about amending entitlement programs or reducing spending. In fact, the $700 billion military budget appears safe, and in February Trump and Congress approved a bump in military spending of at least $61 billion this year, which could swell to $80 billion, with a cap next year of $85 billion. To get the Democrats to go along, there was a $63 billion increase in welfare spending, with an additional $68 billion next year. In the face of all of this, gold and silver prices are slumping. Why? My guess is that the federal government’s financial condition is not recognized. Investors really believe that we “can grow ourselves out of the deficit.” That will not happen. Only with reduced spending will there be a meaningful reduction in deficit spending, and there is no stomach for that in Congress. There is little understanding of what deficit spending does to a nation. Further, with stocks punching out new highs, investors couldn’t care less. When stock prices fall and recessionary signs become widespread, gold and silver will again be in the spotlight, as in 2008. But there is no way to know exactly when that will happen. Many indicators suggest that an end to both stock market highs and the economic recovery is in sight. If so, gold and silver will be the investments to weather the storm.